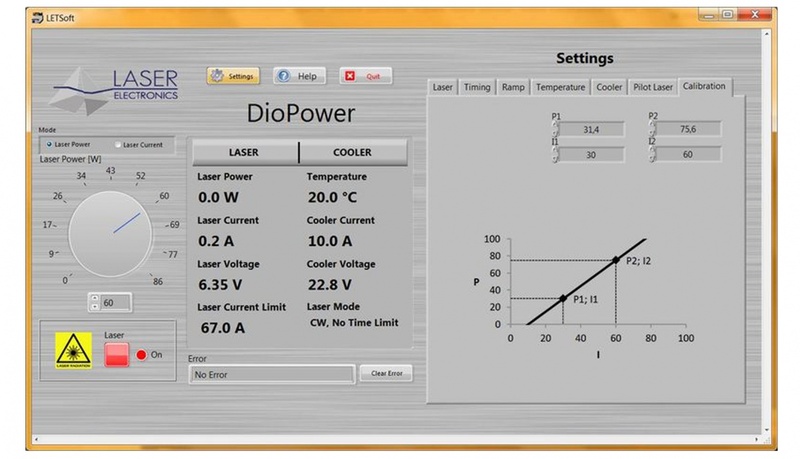 The DioPower conveniently offers an integrated diode laser system. All necessary components such as the laser diode, the laser diode driver, the TEC-driver and the laser diode cooler are included. The customer can choose a suitable laser diode regarding his requirement. An internal microprocessor provides the flexibility and convenience of software. Our LabVIEW based program LETSoft can be used to control the DioPower. All parameters can be set and controlled by a PC via RS232 interface, optional by USB. The DioPower features advanced circuitry to protect both the laser diode and the controller. Safety features include transient suppression, a suitable mains filter, delayed output enable, hardware interlock and a relay closure shorts the laser output when power to the DioPower is turned off. An additional feature is if the laser temperature departs from a user defined temperature window, the laser current is switched off automatically. The instrument can create a ramp shaped laser power. The laser power will go to the new value within a set time linearly. It can ramp up and down. Several ramp parts and also constant power parts can be combined to a customised power function. External inputs allow analogue modulations. An internal pulse generator allows digital modulation. The maximum modulation frequency of the laser diode current is 100Hz. As a safety feature, the laser current limit can not be exceeded during external modulation. The range for the signal is 0 V to +10 V. The transfer function is 10 A / V.
If a high power laser diode is provided with a pilot laser, it can be controlled by the DioPower. The pilot laser can be switched on and off and its optical power intensity can be set. 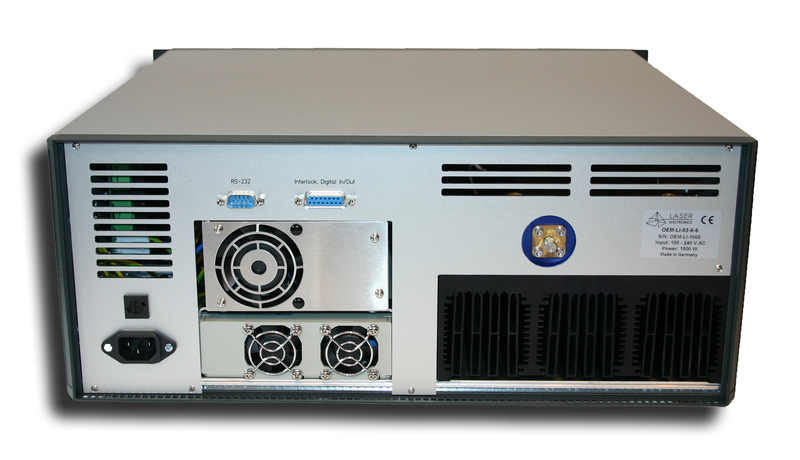 The instrument provides a power monitor output. This signal indicates the actual laser diode current. The range for the signal is 0 V to +10 V. The transfer function is 10 A / V.
Because the laser driver is current controlled, the laser power cannot be controlled directly. But the user can set two calibration points at the P/I characteristic line and the DioPower calculates the set power into set current and measured current into actual power. So the user can choose to set the laser current or set the laser power and can read the actual current and the actual power. In any case of error, such as exceeding the customer set limits, the diode current is turned off immediately and an error message is send to the PC.